Winterthur's pre-season preparations under new captain Mohamed Sameel took a set back as Winterthur lost to their junior neighbours Zurich Crickets on Saturday 21st April 2018. Chasing 172 to win in 20 overs, WCC lost 3 quick wickets Gokul (0), Kasun (5) and Vinat (0) putting them on the backfoot very early with the score 15/3. Shay joined Pradeep in the middle to put up a much needed partnership but in the process, they were blocking off to many deliveries which meant the pressure was building on WCC all the time at the end of 10 overs WCC were 35/3 chasing 172 for Victory. Once the 10th over was completed WCC's Pradeep changed gears and all of a sudden runs started to flow for WCC. Together Pradeep and Shay put on a 35 run partnership, once Shay got out for 15 runs, the Big hitting Sahan and Shijo were sent in to give some impetus to the WCC innings but they were only able to contribute 3 runs among themselves. This brought Mohamed to the crease to join an in form Pradeep, they put together another partnership of 35 runs in quick succession running hard whilst hitting hitting the odd boundary, and then in the penultimate over captain Mo was run out for 7 runs. 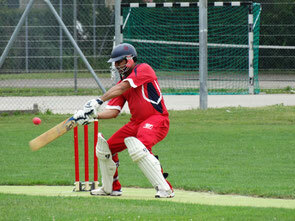 Suhash joined Pradeep in the middle, and soon Pradeep too was out caught in the deep for a very well played 82 runs. Suhash was out bowled for 0 and the two tailenders Elyas and Morsaleen held their wickets as WCC finished their chase at 135/9 in 20 overs.